Synthetic peptide corresponding to a region within amino acids 301-351 of Human Dysbindin (NP_115498.2). Our Abpromise guarantee covers the use of ab118795 in the following tested applications. WB 1/500 - 1/2500. Predicted molecular weight: 39 kDa. The BLOC-1 complex is required for normal biogenesis of lysosome-related organelles, such as platelet dense granules and melanosomes. Plays a role in intracellular vesicle trafficking. Plays a role in synaptic vesicle trafficking and in neurotransmitter release. May be required for normal dopamine homeostasis in the cerebral cortex, hippocampus, and hypothalamus. Plays a role in the regulation of cell surface exposure of DRD2. Contributes to the regulation of dopamine signaling. May play a role in actin cytoskeleton reorganization and neurite outgrowth. May modulate MAPK8 phosphorylation. Detected in brain, in neurons and in neuropil. Detected in dentate gyrus and in pyramidal cells of hippocampus CA2 and CA3 (at protein level). Defects in DTNBP1 are the cause of Hermansky-Pudlak syndrome type 7 (HPS7) [MIM:203300]. Hermansky-Pudlak syndrome (HPS) is a genetically heterogeneous, rare, autosomal recessive disorder characterized by oculocutaneous albinism, bleeding due to platelet storage pool deficiency, and lysosomal storage defects. This syndrome results from defects of diverse cytoplasmic organelles including melanosomes, platelet dense granules and lysosomes. Ceroid storage in the lungs is associated with pulmonary fibrosis, a common cause of premature death in individuals with HPS. Belongs to the dysbindin family. 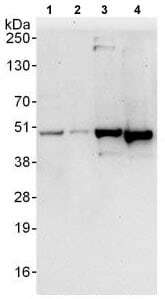 Ubiquitinated by TRIM32. Ubiquitination leads to DTNBP1 degradation. Cytoplasm. Cytoplasmic vesicle membrane. Cytoplasmic vesicle > secretory vesicle > synaptic vesicle membrane. Endosome membrane. Melanosome membrane. Nucleus. Cell junction > synapse > postsynaptic cell membrane > postsynaptic density. Endoplasmic reticulum. Detected in neuron cell bodies, axons and dendrites. Detected at synapses, at post-synaptic density, at pre-synaptic vesicle membranes and microtubules. Detected at tubulovesicular elements in the vicinity of the Golgi apparatus and of melanosomes. Occasionally detected at the membrane of pigmented melanosomes in cultured melanoma cells. Detection of Dysbindin in Immunoprecipitates of HeLa whole cell lysates (1 mg for IP, 20% of IP loaded) using ab118795 at 6 µg/mg lysate for IP (Lane 1) and at 1 µg/ml for subsequent Western blot detection. Lane 2 represents control IgG IP. Publishing research using ab118795? Please let us know so that we can cite the reference in this datasheet. There are currently no Customer reviews or Questions for ab118795.